In 2012, the collaboration between Vroom Foundation Technology and Keller GmhH, a German foundation company that particularly specializes in ground improvement techniques by conducting condensation and injection activities, began. 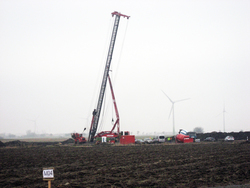 From this joint venture, the first project realized by Vroom in Germany was the creation of vibro piles for the foundation of the Enercon windmill park, Groβheide in Aurich. 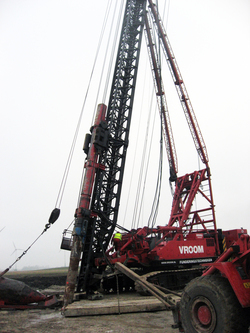 As a result of the collaboration between Keller and Vroom, foundation piles in Germany as well as ground improvement techniques can be offered and realized in the Netherlands. Keller is active worldwide. The parent company has a number of branch offices abroad and various joint ventures. The goal is to work together also for Dutch projects. 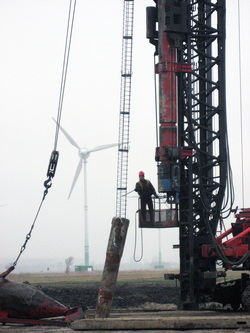 The Groβheide windmill park project in North Germany was the first project for Vroom Foundation Technology to produce vibro piles for. The project includes 8 windmills that are being constructed under the authority of Enercon. 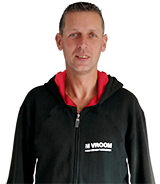 Cajo Vroom has intensively been involved into the collaboration start-up and he expects that after this first project, more will follow. The soil’s characteristics varied per location. For 4 out of the 8 mill foundations, Keller has enhanced these mill foundations so that they could be used on improved ground. Ground improvement activities consisted of the creation of stone columns until a depth of around 10 m’. These columns have been placed 1,5 m’ separated from each other, from core to core, underneath the entire mill foundation. Enhancing the foundation was necessary because ground improvement can only handle load caused by pressure and not by motion. The foundation’s larger diameter cleared this problem out of the way. On the other four locations, the ground improvement did not suffice and therefore, the mills have been founded on vibro piles: 24 and 36 piles per mill. For the foundation of three mills, a pile approximately measuring 22 m’ has been produced and for one mill, a pile that was even around 36 m’ has been used. For this location, the cone penetration test indicated the presence of earthenware clay which can lead to unpleasant surprises during the execution process. Keller and Enercon were particularly curious about the question if the pulling of the casings would cause problems. In such situations, it is common to drive a test pile for precaution. This is how a check-up is made to see if this goes well and how direct damage to the intended pile foundation is prevented. Late 2012, Vroom started with the first mill. After the piling work for this mill was finished, the winter caused some stagnation and the activities were paused for 10 days. The road along the construction site wasn’t solid enough to transport the foundation machine as a whole from one location to the other. Therefore, for transportation purposes, it was taken down, re-adjusted and set up again on the next location. On the final location, the longest piles have been produced. Voor deze locatie gaf de sondering een beeld met een traject van potklei wat toch altijd tot kan leiden. For this location, the cone penetration test showed that earthenware clay can always lead to heavy piling activities. Keller and Enercon were particularly interested in the question if pulling the casings would create any problems. In such situations, it is common to drive a test pile out of precaution. This is how we can check if this goes well and prevent the planned pile foundation from being directly affected. The production process of the test pile went well and as a result, Vroom could directly continue driving the remaining vibro pile casings. The piles slanted forward have ultimately been driven slanting backward as well, only from the outside. For this way of working, some additional ground work and ground improvement was necessary. Generally, the piling activities were successful and went well. There were no cases of extremely heavy piling work or casing-pulling. The project involved flexible piles and the driving depth varied. 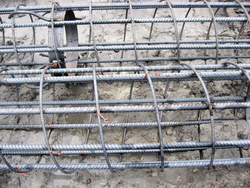 Therefore, the pile driving activities were calendered and for each pile, the reinforcement’s length had to be adjusted right before the concrete was poured. 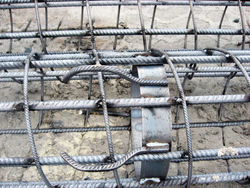 For the rest, the delivered reinforcement was of good quality: tightly braided with a lot of consolidation rings and a small pitch. In approximately 4 weeks, including the stagnation during the winter days, the activities were finished. The project was evaluated with Keller and except from a few remarks that are normally part of the activities conducted by the executing foundation company for German projects, the piling team was praised. Keller, Enercon as well as the geotechnical engineer believed the Vroom team to be very good match. 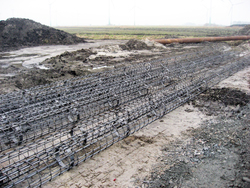 Especially the replacement process of the dragline partitions made a huge impression. The foundation activities have been carried out by machinist Michel Hister with piling process supervisor Guido Hamstra and shovel machinist Jacob Banning.